Poppy was rehomed from Dogs Trust Darlington in March this year. Four weeks ago she escaped from the back garden and her owners, the Dodd family, were beside themselves with worry. Luckily she was wearing her Dogs Trust Pet 24 tag on her collar. Within an hour Pet 24 had called the family to say that Poppy had been found on a nearby street, and 20 minutes later she was back where she belonged. See how happy the boys are to have her safely home again! 'Mrs Poppy' (Mum!) 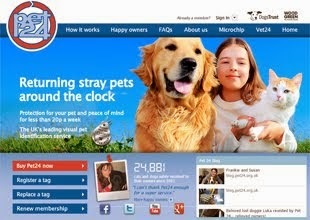 said: 'Thank goodness for Pet 24-it's a great service'.